I have friends who are threatening to leave the country if Trump gets elected. I don’t actually think they will, but I understand the impulse, the feeling of “not belonging” to a country that would elect such a man to the Presidency. There was a lot of that feeling with Bush, but not quite as strongly. It’s not clear how much difference there is between Bush and Trump, but, in addition to bad ideology, Trump comes off as a bully, attracting neo-Nazis and white supremacists out of the woodwork to cheer him on. The fact that, alongside these groups, “regular” Americans would even consider Trump as President reveals something about a segment of our population that is deeply disturbing. My grandparents immigrated to America via Ellis Island in the early 1900s. They were escaping Czarist Russia and pogroms (violent assaults on Jewish villages by the military or any vigilante group of Russians). I can’t even begin to grasp how difficult the decision to leave Russia must have been. Poor as they were. Leaving family as they did. Leaving the only way of life they’d ever known. They must have believed the pogroms of Russia would not affect them in America. That there was hope for a decent life in America never to be hoped for in Russia. IF Trump gets elected, even if we moved to another country, his policies would affect people, animals, the planet, everywhere. Trump would not be a pogrom you could leave behind. Personally, I’d feel a sense of responsibility, a civic, moral duty, if you will, to combat the type of unjust policies he’d carry out, the direct blow that Trump, or really any Republican President would have on the most vulnerable. The poor. People of color. Immigrants. The disabled. The sick. Older people. Children. College age kids. Other nations. The planet. Of course, it’s way too early to predict how the 2016 US Presidential election is going to turn out. What I do know is there is a nervous energy afoot. Fear. Anxiety. Frustration. Cynicism. Despair. Fatalism. There are also action movements afoot. Prison reform. Black Lives Matter. Climate change. Bernie Sanders. There are increasing numbers of people figuring out how they can participate in working for change — for a kinder, more compassionate, more Earth friendly, human and animal friendly civilization. I can’t stop thinking about the millions of refugees fleeing civil war and religious persecution of the most severe kind right now. From the Middle East and Africa. Trying every which way to make it to Europe, to some degree of safety. Submitting to the most hazardous of voyages. The extremity of their dislocation and suffering. How is it possible the EU countries and America are not welcoming them, don’t have plans in place to respond to this terrible human crisis? I listened to a story and interview by Joanna Kakissis on NPR the other day, titled “By Boat, By Bus, By Any Way Possible, One Refugee’s Perilous Journey”. The subject? A Syrian man named Munzar Omar, a school teacher, who had left his wife and two small daughters behind while he attempted the treacherous crossing. He made it — barely —from Syria to Turkey to Greece, where the interview I was listening to had been recorded. From Greece, he made it to Macedonia, then Serbia. His next destination is Hungary, then Germany. He and tens of thousands of others. I imagine him full of desperate hope —planning to get settled, find work, find a way to bring his wife and children to safety. At the end of the interview, Joanna Kakissis says she would try to catch up with him again when he got to Hungary. He tells her he will try to text her when he arrives somewhere, adding if She’s not asleep. His concern for her sleep, bone-weary as he had to be, caught me in a flash flood of tears, like a warm summer thunderstorm. My face was wet, but I was safe. Not so for Munzar. Aside from this man’s determination, almost everything was out of his control. He had no idea how he would get to each stop along the way. And then, from there, where? What? How? It was utterly heartbreaking to contemplate this one man’s journey in a way that hearing about hundreds of thousands hadn’t been. I knew a San Francisco rabbi, Alan Lew. He had been a Zen priest for many years before he returned to Judaism and became a rabbi. Alan said that since we Jews had fled oppression and religious persecution and were refugees in many lands for so many centuries, that we had a responsibility to see our ancestors in the other, the other in ourselves. It’s one thing to identify with the suffering or triumphs of your own people, ethnic group, nation. It’s another to be able to see yourself in the other, and to act accordingly. Alan not only talked the talk, he carried out countless acts of non-violent civil disobedience in alliance with the homeless and immigrants. Alan Lew was a mensch. He wanted all of us to be menschs too. One menschly thing to do would be to stop using words that de-humanize people and distance us from their suffering. Words like migrants, illegals, etc.. Please know that that person from Eritrea or Syria (or Mexico, Guatemala, El Salvador) could be your own grandparent desperately escaping Russia, or anywhere, dangerously crossing an ocean, a desert, severely malnourished and maltreated by human traffickers. Know that many didn’t make it, then, and now. Those of us living here are the descendants of the lucky ones. We should count our blessings, and pay them forward. Children of immigrants, refugees? That, dear friends, would be… all of us. ps. 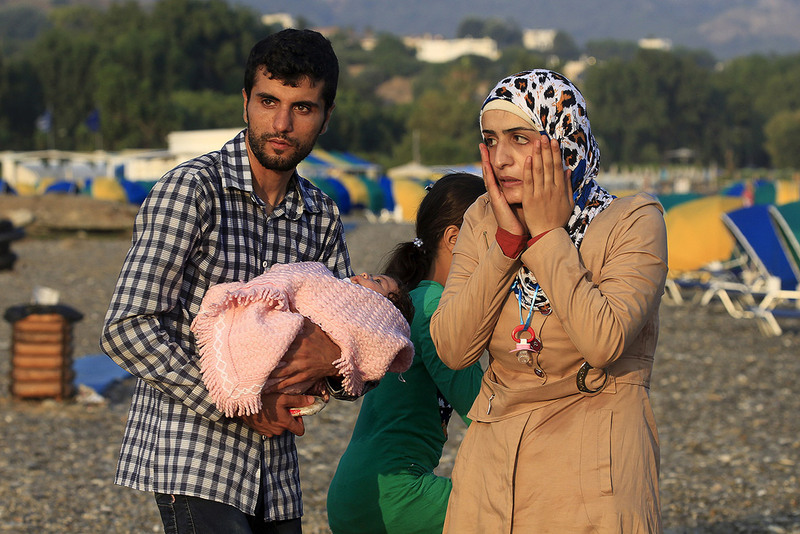 I wanted a picture for this post, so I googled images of refugees in Greece, mostly Syrian. There were So Many to choose from. It was heartbreaking. I don’t know how I chose. I didn’t want to overwhelm you with pictures of hundreds in overloaded inflatable rafts that look ready to sink under the weight, or masses of distressed people on land. So I chose this one. One little exhausted family with a two month old baby. I hope their photo moves you as it did me. The world feels so small now. Even though we live in a bubble of safety here, we are aware of this monumental tragedy unfolding before us. I think about these people fleeing misery and war every day now. As you ask, how is it possible that the EU and America are not working together and coming up with a plan to help them? I heard a story (also on NPR) about how the Greek people, in the Greek islands, are helping to provide water, biscuits and comfort to the people arriving on their shores by the hundreds every day. The Greek people, who are suffering so much themselves due to the financial ruin of their country due to predatory capitalism, and who are losing tourism on their islands now as well, are helping the people landing on their shores, while their government dithers and looks away. There is also so much to be done in so many places. It feels like holes springing in a sinking ship. Where to start? How to make a difference? It all feels so overwhelming and hard to get your head around. I suppose if we all worked on plugging one of the holes by lending a helping hand in some way that we could right some of the wrongs. In our daily lives of media overload it seem challenging. Climate change, ISIS, mass-shootings, on and on. For me, working at a local level is one of the ways I can give back and feel like I make a difference, but I’m afraid that it will take many of us working at an international level to affect change worldwide – much harder to do. No answers, only questions. Next Next post: I Never Wanted to Be a Writer… and a few autobiographical memories.